Due to its temperate and pleasant climate and unique and varying landscapes, not to mention a heaping, helping dose of American history, the state of South Carolina is a very popular tourist destination. 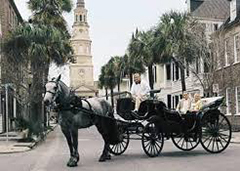 Some attractions found here are famous South Carolina landmarks like its coastal famed beaches. However, others focus on the rich heritage and beauty found in the Palmetto state. Past guests have enjoyed a blend of both, and their most favorite picks are listed here. 1. Myrtle Beach: Not only is this pristine stretch of southern coastline one of the most well known of all South Carolina landmarks, it’s also one of the top vacation destinations in the United States. Here, an interesting balance is struck between the high profile vacation hot spot lined with hotels, shops and restaurants that make up the city proper, and the State Park that provides an almost quiet serenity for those looking to get away from it all. A protected forest situated at the ocean’s edge gives way to what has become known as some of the best fishing and camping in the country. 2. Hilton Head Island: Near the coastline of South Carolina can be found yet another of the state’s most popular resort cities, although Hilton Head is unique in that it’s found on a barrier island. Each year over two million visitors come to enjoy the twelve miles of stunning beaches that this gem amongst South Carolina landmarks is known for, however historically, the island was very important for very different reasons. Serving as an operations base during the Civil War and as a past seasonal retreat for Native Americans, there is more that lies in this coastal resort town than just pretty beaches and gated communities. 3. Brookgreen Gardens: Along the east coast between the two top tourist destinations in South Carolina a botanical gem that has been named one of the ten best public gardens in the United States welcomes its guests. Although the highlights here are seasonal blooms that change with the seasons from daffodils in the spring to sweet olive in the winter, the gardens offer visitors a lot more than just pretty plants. Like many South Carolina landmarks, Brookgreen emphasizes the local landscape, offering a zoo to visitors where state residents like Bald Eagles, owls, foxes and otters can be viewed. An aviary and sculpture display are also on site, and a full day can easily be filled with history, shopping, admiring and more. 4. Hunting Island State Park: For many people, South Carolina has two distinct tourist spots, and that’s about it. However, Hunting Island, although less well known than our number one and number two picks, remains one of the most popular South Carolina landmarks, drawing over a million guests each year. Out of towners may be missing out on the island’s charm that features clean beaches, camping, lagoons, loads of fishing spots, nature trails and boating opportunities. Local resident pelicans and other coastal wildlife greet fewer guests and less crowds, indicating that perhaps one of the state’s best vacation destinations is regularly overlooked altogether. 5. Fort Sumter: Found in the Charleston harbor, this perhaps unimpressive single story structure is a hugely important site in United States history. The masonry sea fort might be one of the most important of all South Carolina landmarks, as it’s the location that was home to the gun shots that marked the start of the Civil War in 1861. Here, the Battle of Fort Sumter began with a demanded surrender. Curiously enough, the structure was not completed when the historic battle began, and it was never filled to its maximum capacity of over six hundred. 6. Historic Charleston: Following the destruction of an iconic hotel likely constructed in the early 1800s, a foundation was developed to preserve the buildings and heritage of the important southern city. There are numerous buildings, museums and educational outlets found here, all important South Carolina landmarks, for guests to explore and discover. Amongst them can be found gems like the Nathaniel Russell house and one of the most popular stops for tourists here, the Aiken Rhett House-Museum. 7. Caesars Head State Park: Away from the lowland coastlines of the state can be found perhaps their natural opposite. Towering, natural South Carolina landmarks comprising the Blue Ridge Escarpment lure thousands upon thousands of tourists each and every year. They come to take in the natural beauty found in the Jones Gap State Park, and participate in hawk watching programs offered. From peaks and gneisses, visitors can catch unparalleled views, stretching all the way to neighboring state, Georgia. 8. Table Rock State Park: North of Greenville near the North Carolina border can be found an absolutely massive same-named mountain that is the centerpiece of this scenic State Park, one of the most breathtaking of all South Carolina landmarks. In the three thousand acre preserve, waterfalls, a pair of lakes and some of the best hiking in the United States await visitors who come to camp, explore and relax. 9. Falls Park on the Reedy: Known as the birthplace of Greenville, this historic park is smack dab in the middle of the southern city’s hustle and bustle and is known as an important local treasure. However, it’s also important amongst South Carolina landmarks because unlike many on our top ten list that are perhaps a bit more alluring to tourists, this community oasis is cherished by the local people who live in Greenville, who enjoy it for work, play and socialization in a beautiful, natural environment. Cascading waterfalls, flower edged paths and illuminated overpasses all come together in a tourist friendly yet locally loved attraction. 10. Congaree National Park: Most people may not quite know what ‘old growth bottomland hardwood forest’ is. Thankfully, knowledge about the historical significance of this largest intact remnant of this type of forest isn’t necessary for guests to come and enjoy its beauty. Near Columbia, a duo of rivers (the Congaree and the Wateree) provide the sustenance needed to this unique ecosystem, which in turn feeds national and state champion trees, some of the most ancient of South Carolina landmarks. The densely packed trees covering the floodplain provide shade and stunning examples of natural light, framing the swampy area’s multiple examples of biodiversity.